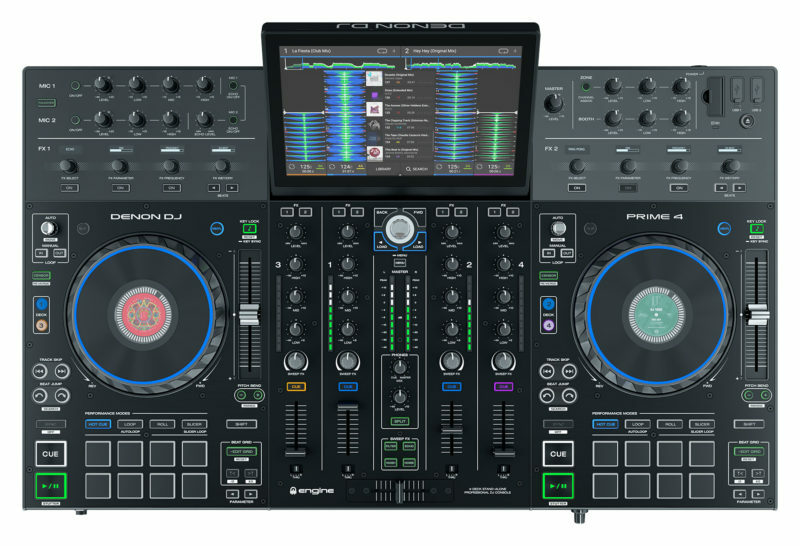 It features a massive, adjustable 10” HD display which supports multi-touch gestures, rugged metal construction including the 6-inch jog wheels, 4 assignable inputs (for connecting media players or turntables), 2 dedicated XLR mic inputs with individual control, 8 performance trigger pads per side, and a suite of effects taken straight from Denon’s flagship mixer, the X1800 Prime. 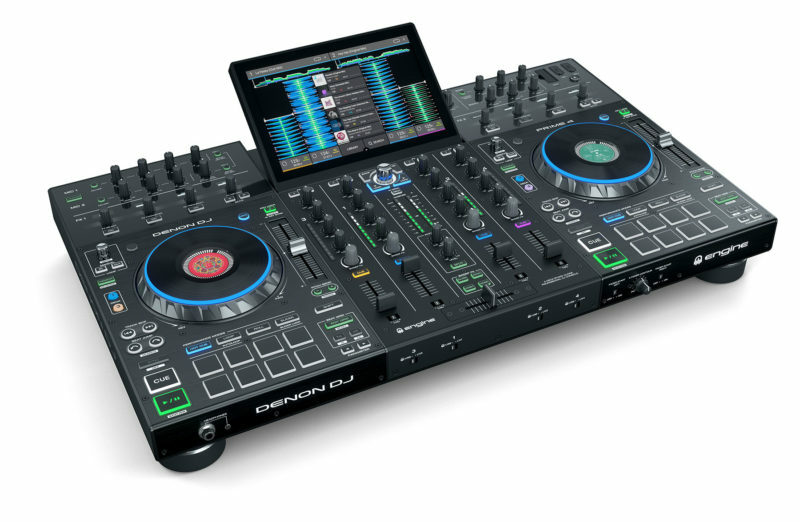 Of course, being a standalone DJ system, it can play music straight from USB. Or, more specifically, from one of its four USB inputs… two of them around the back of the unit, and two on top. You can also play from an SD card. The Prime 4 is able to play uncompressed music (such as FLAC, ALAC, or WAV files)… and you can use any one of these sources to record your DJ sets. So let’s think about this: you could be DJing using your internal hard drive, plus a thumb drive with the latest tunes you just downloaded, in a B2B set with two friends who brought their own thumb drives, record that entire set to an SD card, and still have a leftover USB port. Incredible. Plus, using Denon’s Engine Prime music management system, you can import digital collections effortlessly from iTunes, Serato DJ Pro, Traktor Pro, and Rekordbox. Engine will import existing playlists, folders, hot cues, and loop information from these libraries, and can be done from Denon’s free software or from the Prime 4 itself. The device will internally analyze music data with no laptop needed. 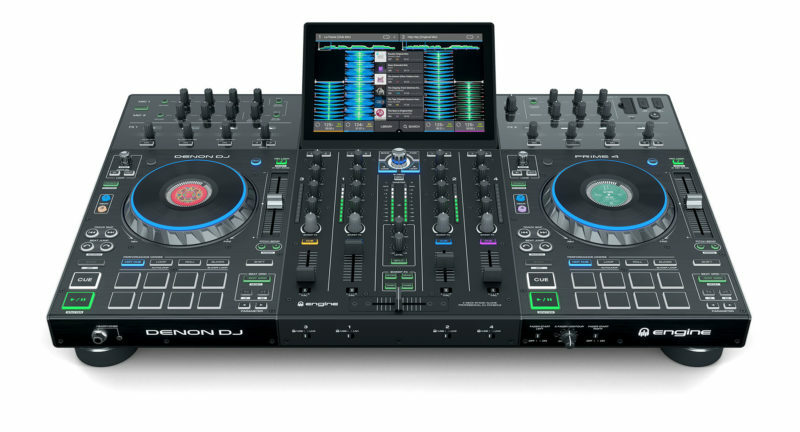 Denon also states that integrated support is available for Traktor (presumably you’ll be able to use this “as a controller” in that software), and that control of Serato DJ Pro software is coming soon. The touch screen has an adjustable angle, ensuring that you can see it comfortably and in any lighting situation. From this screen you can select tracks, view vertical waveforms, and interact with your music collection using multi-touch gestures. According to Denon, “it’s the touchscreen experience you expect and deserve”. But if you’re not a fan of using touchscreens, don’t fret… it even allows you to connect an external USB keyboard for track searching. The platters themselves have integrated screens, too… a feature similar to Denon’s SC5000 Prime player, giving you performance information or displaying album artwork Those touch-capacitive platters also feature an RGB light ring which is customizable, so you can change the color to your personal preference. Speaking of displays, those FX also have their very own tiny dedicated screens. And of course, the Prime 4 also features dedicated single-knob Sweep FX, giving you easy access to things like high and low-pass filters. For those wanting to really go pro, the unit also uses a connection which Denon calls StagelinQ… which allows you to bring dynamic visuals, video scenes, and other outside effects to your performances. This is made possible through partnerships Denon has with SoundSwitch, Timecode, and Resolume. Discover Soundswitch, Resolume, and Timecode. This makes it possible those behind the stage to do really interesting things with visuals, such as do video transitions at the exact same time the DJ is fading from track A to B, have “video scratching” in perfect sync with the jog wheel movements, or otherwise trigger scripted events. Finally, one more really cool feature of the Denon Prime 4 is its inclusion of Independent Zone Output. This literally allows you to DJ two rooms at once (such as a night club, which has a separate “chill out room” or restaurant.) The second zone can be put on “autopilot”, freeing you to perform your set to the main room. Friday Five: Why Do Turntables Never Work Right In Clubs? 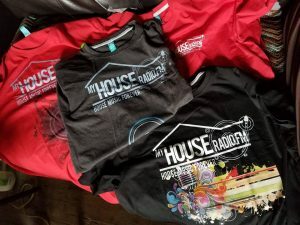 Donate to help bring even more features and music from around the world!